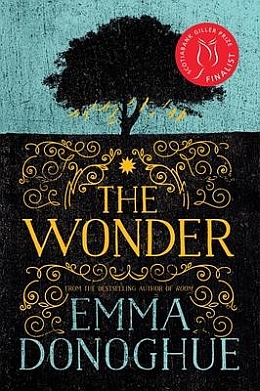 A Scotiabank Giller Prize finalist and #1 bestseller, The Wonder is the latest masterpiece from Man Booker Prize—nominated author Emma Donoghue. The Toronto Star praises The Wonder as “a thoroughly enjoyable read from one of the country’s premier storytellers.” Emma Donoghue takes the reader back to 1850s Ireland, where a village is baffled by Anna O’Donnell’s fast. The little girl appears to be thriving after months without food, and the story of this “wonder” has reached fever pitch. Tourists flock to the O’Donnell family’s cabin, and an international journalist is sent to cover the sensational story. Enter Lib, an English nurse trained by Florence Nightingale, who is hired to keep watch for two weeks and determine whether or not Anna is a fraud. As Anna deteriorates, Lib finds herself responsible not just for the care of a child, but for getting to the root of why the child may actually be the victim of murder in slow motion. The Wonder works beautifully on many levels—as a simple tale of two strangers who will transform each other’s lives, as a powerful psychological thriller and as a story of love pitted against evil in its many masks. “A masterful, gorgeous, and wickedly well written book. “Threading her stories together like a master weaver, Donoghue takes the reader deeper and deeper into the tapestry of Kissing The Witch. A masterful, gorgeous, and wickedly well written book. Donoghue excels at the microcosm, and her obsessive interest in rooting out the truth makes for a compulsive read. A war is being waged in Anna’s tiny bedroom, and its combatants stand for sides not narrowly confined to the Victorian era: science versus faith, progress versus tradition, rich versus poor. “The Wonder unfolds a cagey, suspenseful stand-off . . . Anna receives the author’s full sympathies and is a lively, endearing foil to her incredulous nurse. “A tense gothic page-turner in which nobody, including the unreliable nurse narrator, are entirely what they seem. A powerful exploration of religion and the sway it holds, The Wonder is equal parts psychological drama and unorthodox love story. A thoroughly enjoyable read from one of the country’s premier storytellers. Emma Donoghue was born in Dublin and lived in England for many years before moving to Canada. She writes in many genres, including theatre, radio drama and literary history, but is best known for her fiction, both historical (Slammerkin, The Sealed Letter, Astray, Frog Music) and contemporary (Stir-fry, Hood, Landing, Touchy Subjects). Her seventh novel, Room, won the Rogers Writers’ Trust Fiction Prize and the Commonwealth Writers’ Prize (Canada and the Caribbean region) and was shortlisted for the Man Booker and Orange Prizes. It sold more than two million copies. Donoghue scripted the film adaptation, a Canadian-Irish film by Lenny Abrahamson starring Brie Larson, which was nominated for four Academy Awards, including Best Picture.